Once her parents set up the studio lights in their simple one-room Bangkok home, 18-year-old “Fai” bursts into action. She’s loud and sassy, dancing and laughing as she welcomes her fans to a live broadcast of another make-up tutorial, sponsored by a local brand. Fai gets herself up on her shortened leg, balancing with her full-sized leg, and shimmies her body to the loud R&B music. She has no arms and shows off her bare rounded shoulders by wearing just a crop top. Over the next hour, Fai demonstrates how she uses the sponsor’s products — doing everything with her toes. She puts on green contact lenses, attaches fake eyelashes, brushes on foundation, and carefully applies lipstick and eyeliner. “Today I got 4,000 [viewers], which is very good,” said Fai, who usually goes by her nickname (meaning “cotton”) rather than her Thai name Bunthida Chinnawong. “The most difficult thing is to pick up the small things, like the eyelashes I did during the live [stream],” Fai said. Fai was born with no arms, a shortened right leg, a curved spine and only one lung. “The doctor told me to be prepared, that she would not live longer than nine months,” Fai’s mother, Pin Saleepote, said. As the young girl grew older, the inevitable question arose. “She asked me why didn’t she have arms like others and when she was young I lied to her and said that they will grow,” Fai’s mother said. Fai’s love of cosmetics started early, when she would steal it from her older sister and mother. But make-up was not allowed at her special school for disabled children. Fai describes the school as a safe and convenient place, which her “mafia gang” of naughty friends did their best to turn upside down. “We raced each other in our wheelchairs on the ramps from the third floor to the first floor,” she said. She used that stubbornness to convince her parents to send her to a “normal” school. “Jane” is 17-year old Nipaporn Kongsungnoen, one of Fai’s close friends. “She was fun to be with, she would make people smile and laugh,” Jane said. When Fai saw her new friends putting on make-up, it was as if a new world opened up and she started to work out how to do it with her nimble toes. “It came from naturally, but also took practice,” Fai said. She had to overcome the idea in Thai culture that the feet are the lowest part of the body. “Many people think feet are low parts but I don’t think so, my feet bought me this far so it’s ok for me,” she said. Fai scrolls and taps a smartphone with all the ease of someone using their hands, and she started using Facebook to broadcast her make-up tutorials. She battled against the traditional views of beauty in her culture. And yet, she recently had plastic surgery on her nose and a classic teenager’s problem. “I am not beautiful now, I still have pimples,” Fai said, laughing. The beauty blogger has no time for haters. Fai has more than 170,000 followers on Facebook, and her regular live broadcasts are bringing in money and fame. “I didn’t expect she would be this famous, I’m so happy for her that she became so well-known,” Suchada Kamnaen, another of Fai’s school friends, said. Fair decided to share her story more openly when she learned about people committing suicide. “It made me think, ‘Their lives are better than mine … but they chose to end their lives by killing themselves’,” she said. Each day is precious for Fai. She lives with the constant risk that her curved spine will push into her one lung and damage it. When she was around nine years old, a doctor suggested surgery to try to straighten her spine but only gave her a 15 per cent chance of surviving the operation. “I told him I prefer to live like this,” Fai said. Despite her precarious health, Fai is dreaming big. “I heard there are beautiful cities in Australia, so I want to go around and take pictures; I want to try their food to see if it is more delicious than Thai food,” she said. 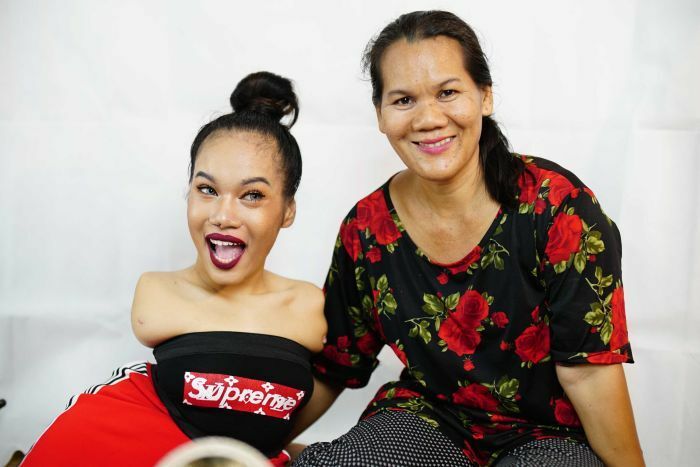 She also wants to model on the catwalk — “I can model in a wheelchair, it’s fine, right?” — and become a television host. “I want to show people the ability I have, I want to be world famous like other vloggers,” Fai said. And the 18-year-old has a message for the doctor who said she’d never see her first birthday.